I continue to get quite a few requests for Updo Hairstyles, for all the homecoming dances this Fall, so here is another very elegant-looking bun style that is perfect for occasions such as prom, homecoming, dance/ballet recitals, weddings, etc. 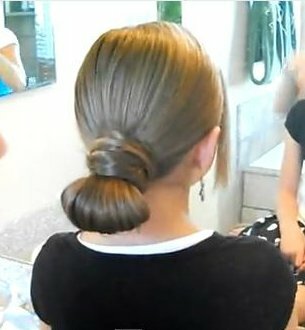 What is different about this bun style is that you wrap strands of the the half ponytail around the other half, each strand wrapped in the opposite direction. You end up with a cross-over “wrapped” bun look that is absolutely gorgeous. Items Needed: Spray bottle, rat-tail comb, straightener, 2 ponytail holders, hairspray, 10 +/- bobby pins. If you like this bun hairstyle, be sure to let us know! Happy Hairdoing!